I just installed three new nucs and I’m completely soaked in sweat. Here’s one that doesn’t have a proper top cover yet, but the bees don’t care. By the way, now is an excellent time to look for the queen, to learn how to spot her, how she moves and wiggles across the frame and all that jazz. There are hardly any bees in the hive and there are only a few frames to inspect. The chances of spotting her couldn’t be better. 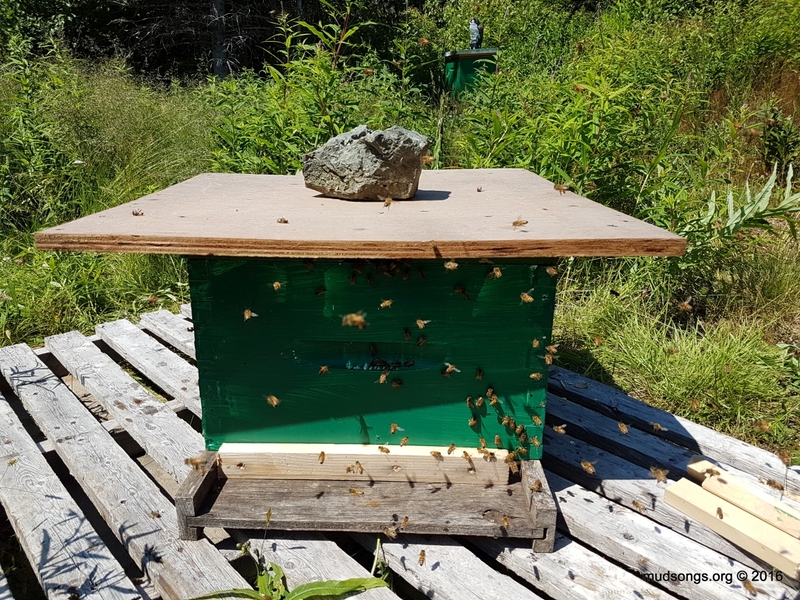 I wish I’d taken the time to look for the queen when I installed my first nucs. It subsquently took me a year before I managed to spot any of my queens. This entry was posted in Month of July, Nucs, Queens, Year 2016. Bookmark the permalink. Hi Sharon — Sorry for the late reply. I was off the grid for a few days. None of my queens are marked. That’s cheating anyway (joke).